You might have wondered... With nearly 750 sick sea turtles admitted to our Quincy Animal Care Center since mid November, how are we able to function and provide care to these animals? Well, here is your answer... Team work! NEAQ staff and interns working side by side with our colleagues from Virginia Aquarium visiting to help treat endangered sea turtles . We have discussed many times before the importance of our partners at Mass Audubon Wellfleet Bay Wildlife Sanctuary - it is thanks to their staff and volunteers who walk countless beaches at all hours of the day and night, in all weather conditions, that these turtles were rescued, recovered, triaged and transported to the NEAQ. Our rescue volunteers and interns have also worked tirelessly for the past four weeks, giving us any free hour they have and often working very long days. In this post we would like to introduce you to our partners and colleagues from other stranding network organizations who are supporting us through this event by providing their staff, interns, volunteers and other resources such as transport vehicles. IFAW staff member working with Katie Pugliares, NEAQ rescue staff, on a Kemp's ridley sea turtle. Our colleague from the marine mammal department who was helping us out that day is looking at the master turtle board locating the next turtle scheduled for treatment. There is not a single Rescue Department staff in the picture above! The few people in green scrubs are NEAQ rescue volunteers and interns, while everyone else is representing another departments or organizatios: NH Seacoast Science Center, IFAW, and NEAQ marine mammal and education departments. 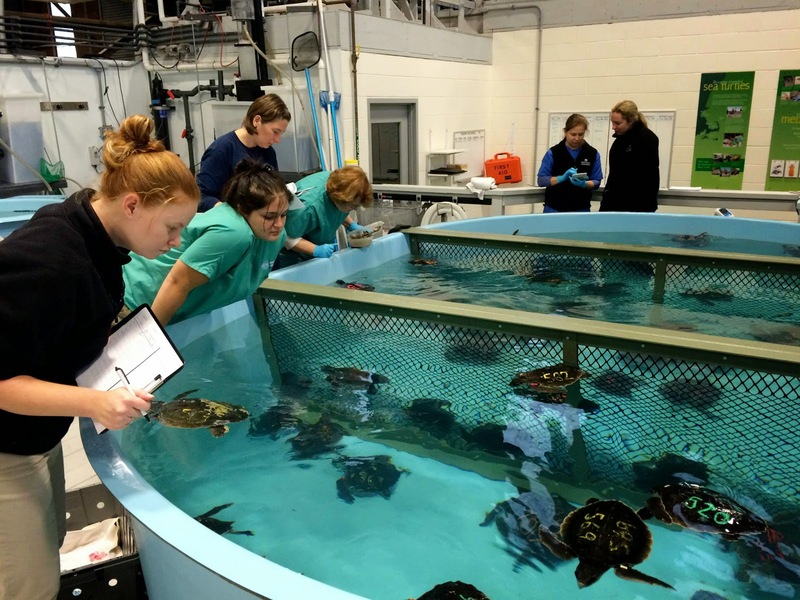 Our colleagues from the National Aquarium in Baltimore as well as another Virginia Aquarium staff member were helping with treatments and feedings of sea turtles all of last week. ... or a stack of empty banana boxes readied for an upcoming transport. NOAA Fisheries provided their staff and a vehicle to transport numerous sea turtles to other facilities as well to local airports where the animals were flying from to secondary facilities down south. While our team is treating, swimming, and feeding the sea turtles, the staff at the Animal Health Department is tirelessly processing and analyzing the blood samples, taking x-ray pictures of our patients and then reading and interpreting the results to come up with best treatment plans. After the x-ray pictures are downloaded to the computer it is necessary to check if they came out okay before sending the patient back to its rehabilitation pool. X-ray pictures of sea turtle NEST-14-500-Lk. The picture on the left was taken just a few days after the animal was admitted to NEAQ and shows severe pneumonia - the area affected looks like a "bubble wrap" and some of it is pointed with arrows. 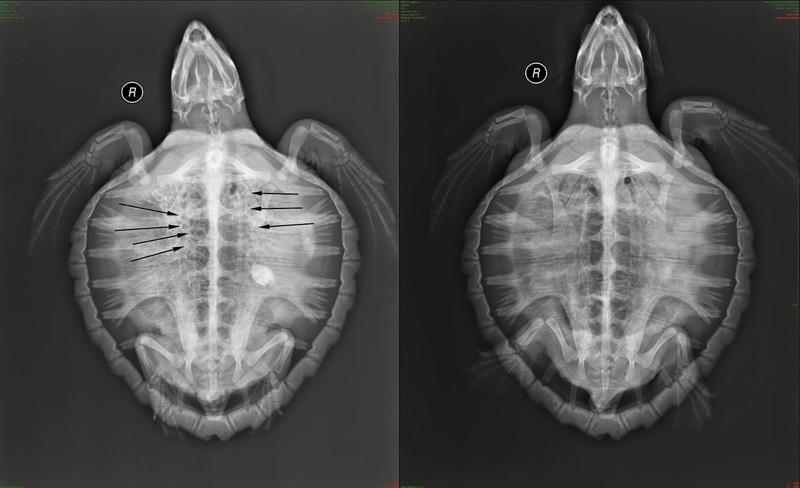 The picture on the right is the same turtle after undergoing two weeks of rehabilitation and antibiotic therapy - the "bubble wrap" like area is almost non existing indicating recession of pneumonia! We would like to take this opportunity to thank all of our rescue volunteers and interns, Mass Adudubon at Wellfleet Bay staff and volunteers, NEAq Animal Health department staff, other NEAQ departments who sent staff to help, as well as our colleagues from stranding network organizations and other institutions: International Fund for Animal Welfare (IFAW), Virginia Aquarium and Marine Science Center, NOAA Fisheries, National Aquarium in Baltimore, Seacoast Science Center (SSC), National Marine Life Center (NMLC), Mystic Aquarium and Institute for Exploration, and MSPCA Nevins Farm staff and volunteers. A sincere THANK YOU to those mentioned above and the countless volunteers making the care of these endangered turtles possible.